The sweetest accessory case for travels and adventures! Detailed with the adorable Chat Under The Clouds artwork in pastel green and ruby red tones, the case has a unique scalloped front panel to decorate. 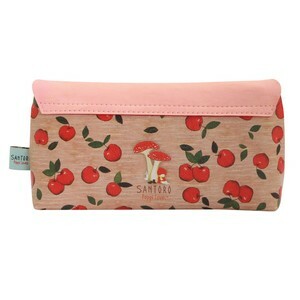 The sides are embellished with a delightful repeat apple print in sandy hues, and the case has a press stud to open. 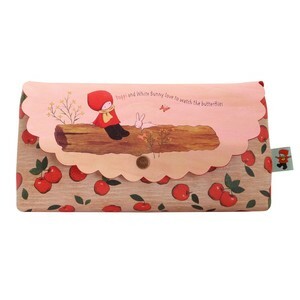 Pull the antique brass effect apple shaped zip to reveal a nature inspired interior lining of butterflies, bunnies and flowers, and ample interior space for stationery, crafts, keepsakes and treasures. A charming addition to any desk, dresser or handbag!